This fair trade handcrafted rainbow ark is hugely popular with children. 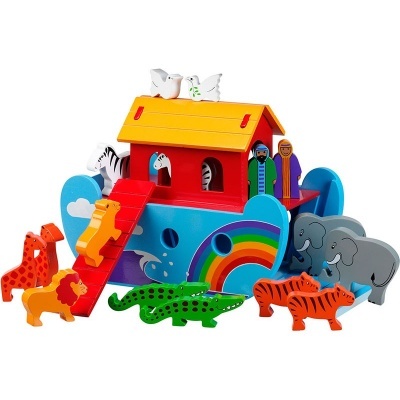 This set contains a Rainbow Ark plus 7 pairs of animals and Mr and Mrs Noah. Lanka Kade's small wooden rainbow ark comes complete with Mr & Mrs Noah and 7 pairs of wooden animals. This fair trade handcrafted ark is hugely popular with children and the ideal toy for teaching the epic biblical story. A traditional toy favoured as a christening gift.